1. Rinse Mussels under cold running water. 2. In a soup pot with a tight-fitting cover, heat olive oil, then add basil, garlic, shallots and a pinch of salt and pepper. Sauté until shallots and garlic are softened, about 3 minutes. 3. Pour in ale and fish stock and bring to a simmer. Add Mussels and cover pot. 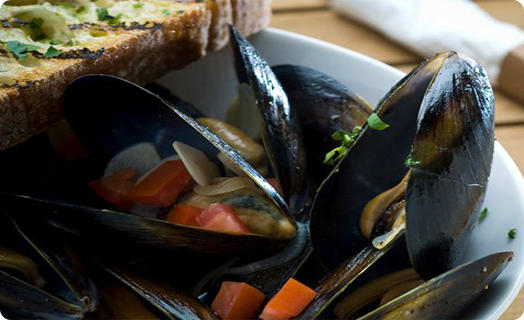 Let Mussels steam, stirring once or twice, until they open, 5 to 10 minutes. Discard any Mussels that have not opened. 3. Pour Mussels into a large serving bowl and serve with bread for sopping up juices.